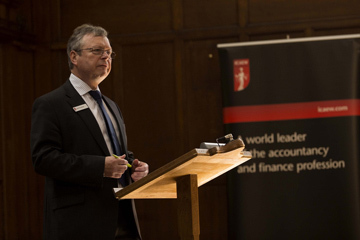 To acknowledge their successful students in ICAEW examinations the Northern Society held a special event in King’s Hall, Newcastle University on Saturday 18 April 2015. All students who had completed their Advanced Stage exams in 2014 were invited plus students who were best in a subject or had excelled across all subject papers and were included in the Northern Society Order of Merit at the Advanced Stage or the Professional Stage exams during 2014. Over 210 students and guests attended the ‘graduation style’ awards ceremony. They were welcomed by Andrew Jackson, President of Northern Society who works at the National Audit Office in Newcastle. Andrew congratulated the students on their exam successes and thanked the students’ families for their support over the 3 year training period. Hilary Lindsay, ICAEW Vice President, who was also in attendance, welcomed them to the profession and encouraged them to make full use of their ICAEW membership and continue to excel in providing strong business finance skills for the organisations they worked with. 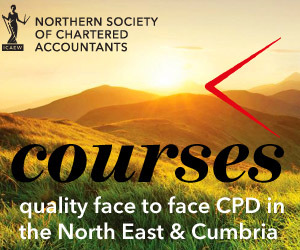 Keith Proudfoot, ICAEW Regional Director Northern and Scotland announced the names of those students who had achieved high marks in the ICAEW exams as well as those who had attained all round success on every exam paper and were placed on the Northern Society Order of Merit. 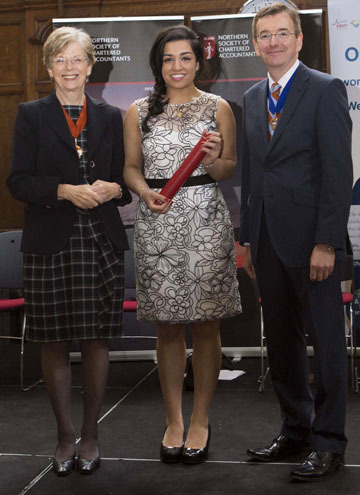 Following the presentation of certificates and prizes a keynote address was delivered by Geoff Ford MBE, Chairman of Ford Aerospace who referred to the opportunities that were available for newly qualified chartered accountants working in businesses across northern England.